Watch this 17 minute video - or read at least, Section One below. If you are not then alarmed and concerned, you have been pacified. Fine Gael, Fianna Fail, Labour and more, thank you for this complacency. Your data should be YOUR financial asset - NOT OTHERS. Read below and find out more what more they are hiding from you. Elected won't talk about it. They have been avoiding it like the issue doesn't exist. It does. They are deliberately not making the public aware that the nation faces a growing critical national and personal problem. The issue? Your information. When Irish government, at one stage or other made up of Fianna Fiail, the Green Party, Fine Gael and Labour, brought about "Irish Water", they all were party (no pun intended) to advancing a process that further sees Ireland's people exploited. We are not talking here about the still on going attempts to recharge yet again for something the public already pay for at least twice through taxation on homes and vehicles. No, We are talking here about peoples very personal information, its value, their ownership rights to it, how all this is being quiet taken away from them - and they are not being told. Some people became quickly aware that the company was out to obtain people's PPS numbers. To many, this was, it was thought, just in order to see that the taxpayers could be further tracked and kept an eye on while being further bullied into paying yet again for the same thing. However, as we shall see, that was only a small part of a much larger picture. 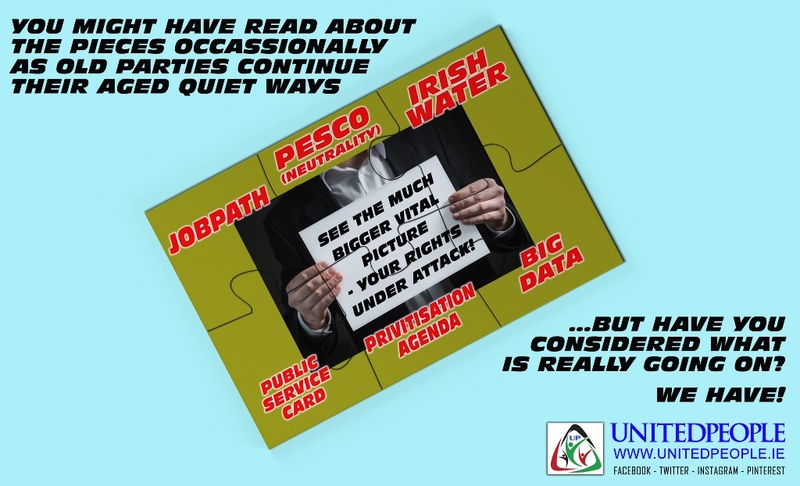 The various governments saw to it that legislation surrounding Irish Water incorporated a much unknown but extremely important issue - buried under legal jargon which elected was (and still is) keeping quiet about. Additional legal detail which is not being more passed on to the public but kept more silent, is about the private company 'RESERVING THE RIGHT TO PASS ON ALL INFORMATION TO THIRD PARTIES, INCLUDING MARKETING AND CREDIT CHECKING COMPANIES' of all individuals who wanted to be signed up (or not) to the business. As we now know, the government has handed the private company, everyone's personal data - lock, stock and barrel! For those that thought this was only to bring about that people could be further just tracked and recharged - nothing could be further from the truth - there was more to it. Hidden with in the legislation that was Dail rammed through (via a private agenda adopted by individual parties without consultation with the nation's people - not very democratic?) was further fine detail giving options for the government to change the law further concerning personal data. To make it possible for a private company to own your personal data, legal recognise it as an "asset" and then have the unrestrained free ability to sell it off to whomever - and whenever they liked. ‘The small print on the Irish Water website referred to a procedure for selling the company, and how Irish Water “may disclose Customer data to the prospective seller or buyer”; and that customers’ personal data “will be one of the transferred assets”. Now, lets be very clear here. This section of the UnitedPeople website is not about Irish Water itself. That section is HERE. No. Irish Water is just one more step amid a long process that has been going on for quiet some time. Even now AFTER Irish Water has been dodgy established under questionable legal circumstances (possible breaking of Irish and European monopoly laws) the continuing ongoing process to exploit personal data, has further continued. Before we get to that, let's explain why personal data is worth turning into an "asset". The extensive report went further. "There are five broad ways in which using big data can create value." Second, as organizations create and store more transactional data in digital form, they can collect more accurate and detailed performance information on everything from product inventories to sick days, and therefore expose variability and boost performance. Leading companies are using data collection and analysis to conduct controlled experiments to make better management decisions; others are using data for basic low-frequency forecasting to high-frequency nowcasting to adjust their business levers just in time. Fourth, sophisticated analytics can substantially improve decision-making. All the above in part sounds good. It's being sold as safety and more targeting marketing. However, when you really think about it, it means that your personal data, your health care details, the drugs you take, the every specific products you buy, the specific items you give your children, the programmes they (and you) watch, the books, papers and magazines you read, your current state of health and far more, is being daily recorded by the hour in digital transferable data (through barcodes and more) - and then being sold off completely to strangers the world over. Unknown (to you) hidden digital data files are being built up on yourself and your offspring (from your phone, your barcodes, your PC, your laptop, your supermarket bill etc). Buy a pregnancy test kit? Private business or the state can know and can pass that info on when they gain it. How? For a start, think barcode, your location being phone tracked (your mobile number is registered) as each purchase is made and additionally, that clubcard registered to your name. Think any other item that is bought by your debit or credit card. As you buy it, they know your location too. Your phone, as you will have seen in a video here, is also a 24 hour a day, tracking device. Even when you think it's switched off and battery removed (the same tiny ability that keeps your phone clock going, also keeps the tracking ability going so your position can be triangulated at all times). Clever but well written computer analytic code can amalgamate all this and further data info obtained, into an eventual huge personal data file that can tell everyone, anything and everything about YOU! This data is a 'goldmine' to other agencies, state and private business, for further exploitation to their advantage - not yours. Google "Data Mining". This is not science fiction. It is not fiction of any kind. This is happening RIGHT NOW. More on the above, will be exposed in section two, for those that wish to delve further. correctly assume your data now is a considerable financial asset. When you are 'invited' to participate in "Seetec" (private company handed citizens data by the state - without express permission), they tell you to sign the second last page of a booklet handed to you! This authorisation from you they ask, then gives them a legal right to pass your information on to whomever they consider appropriate at any or all stages of they existing till the day you die (and even then afterwards). They are in fact, asking you to give up your right to your full data privacy. If you don't sign? They claim they will report you to the state and then have finances cut off. Blackmail or coercion anyone? Where your personal information goes then after... that is anyone's guess! You would not be informed that they are passing your information on to anyone - nor would they seek your permission to do so. All part of the silent privatisation agenda of state services, advanced by Fine Gael and Labour. Your data protection rights and your right to maintain any greater privacy (along with any future children) are being quietly stripped away bit by bit, by established parties previously or presently in government. "I received an invitation letter to attend Turas Nua in either May or June and had been attending for a short while when I got a job offer in August, so I signed off the dole and have not been in receipt of any welfare payment since. Yet. I still was receiving phone calls from Turas Nua wanting to know if I was still working full time and asking for my employers registration number. So two weeks ago I e-mailed them telling them that I did not need their help and if I did then I would contact them. I received an e-mail from a lady called XXXXXX XXXXXX telling me that if I would not give Turas Nua updates on my current circumstances then they would contact my employer directly and ask them because they are entitled to do this. When I read this I was furious because for obvious reasons I don't want my employer or colleagues knowing my business and again I repeat I am NOT on any social welfare payment nor did Turas Nua find me this employment. So what right have this private organisation to contact my employer to find out anything about me?" You might not be aware - but JobPath operators have included it in contract small print that they can contact anyone you get employed by - if you sign any form that they shove in front of you in order to enroll with their service (note: Fine Gael and co have wrote the laws that you have little choice. So much for allowed self-determination as stated in the Irish Constitution). They don't point out the digital data sharing aspect most of the time - if ever! On a rare occasion they do - some people find themselves in a pressured position where they have no choice but to sign - else they will suffer a possible loss of benefits etc. State legalised and backed, blackmail or coercion tactics? Fair and democratic - or the state treating its own people more draconian in ways, similar to Irish history, pre-1916/1921? 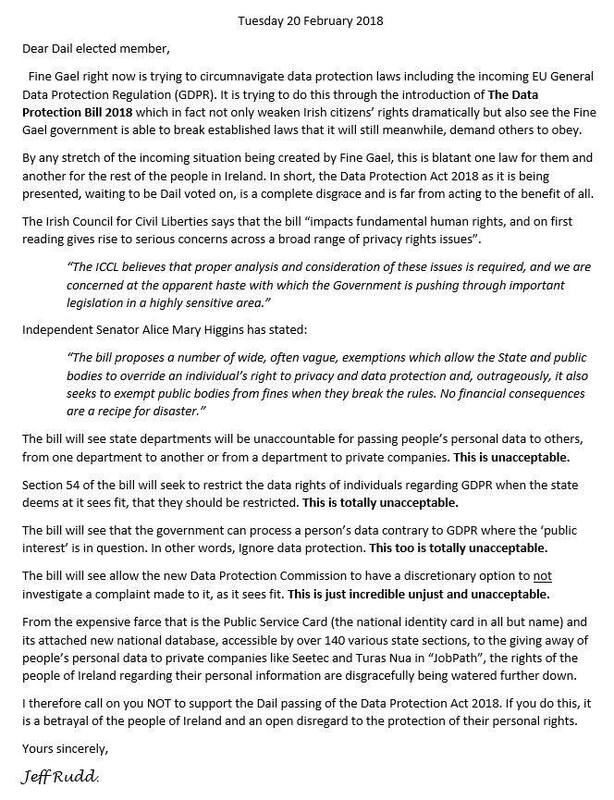 Citizens data continues, to this very day, to be deliberate (a) hunted out and then stored before also being (b) digital transferred to private companies brought in while Fine Gael and Co continue their own adopted (and TTIP treaty) agenda of state services privatisation, by a quiet back-door route. In recent years, people's personal data has been handed by state departments, without any express permission sought, over to private companies now administrating once government and local council services. These include those related to student grants, collection of revenue, the unemployed, the national census and more. The current mainstream parties are not telling their public all this, of course! Some occasionally say that all personal identifiable data is stripped out - but as those in the I.T. world very well know - even the remaining information when amalgamated and analytical gone over, can re-incorporate your further personal details back into it again. Of course some elected know this - but they are also not passing this serious bit of information onto you too. You are their last thought - if they think of you at all? In the case of the state handing over information, they had over everything to the likes of Seetec, Turas Nua, Abtran and more that does still contain specific person, detailed data. This recognised "asset" data is then transferable elsewhere onward, at their will onto third, fourth, etc, or more directions - all with no further consent asked or details given to individuals nor guarantees as to further data security. As the world now knows, banks, companies, online game servers and more have been monthly repeated hacked and people's information stolen. This data has often shown up on the 'dark web' for sale, so that identity theft and more exploitation for thief gain, can quiet occur. All this should be alarming to everyone. It's real-time happening. Meanwhile, the state continues, what UnitedPeople considers to be very undemocratic in process, to give away people's very personal data, their "asset" to whomever the hell the state likes, every second, every hour and day of the week, if it just wants to! Currently those elected, that do rare fringe refer to the topic of data protection, offer assurances that "all your data is safe". In a period of time when we monthly or weekly hear that the strongest servers in the world are hacked, how safe alone, are those reassurances? In offering those distracting reassurances, they take people's attention away form the fact that (a) your personal data has been legal turned into a financial state asset and (b) then transferred onward - often to further private companies - all without you (or your children) being informed or your express permission sought. Fine Gael, Labour, Fianna Fail and others are now allowing the continuing transfer of personal data over to others external to state departments - ones that previously told people, their information would remain with them and not go anywhere. They are allowing and carrying out the act of transferring same asset data to private companies - who then can have the ability to sell it further or quietly further exploit it in other ways. In real digital marketing terms, the world is entering a new phase. "Big Data" has become a very real thing worth billions of Euro to those that can gain that data and exploit it against citizens. In section two below, we shall say how this is possible - if not happening already! For now, you should be seriously concerned that the state (a) sees your personal data as a financial asset and (b) is giving your "asset" away without your express permission - at no gain to yourself but only for state and growing private company financial gain. All this is something that UnitedPeople is extremely alarmed about. For those that wander into section two, you shall see why. 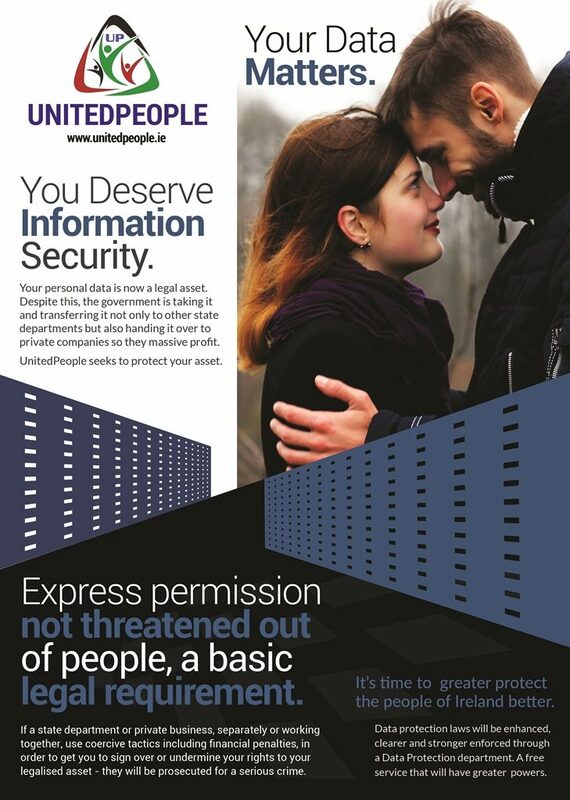 One of UnitedPeople's objectives is to see and help bring about stronger national and local legislation in relation to data protection. Citizens should have a clear constitution right to ownership of their personal data. Citizens should have to be legal told as to when their data is transferred, to whom and why! Citizens express permission should be sought before ANY data transfer takes place, be it between state department to state department, state department to private enterprise or private enterprise to further private enterprise. All transfer permission sought, should be given without ANY methods, legal or otherwise, in terms of blackmail or coercion. Citizens should have the legal right in a number of circumstances, to opt-out of their personal information being digital data collected - and also then shared. 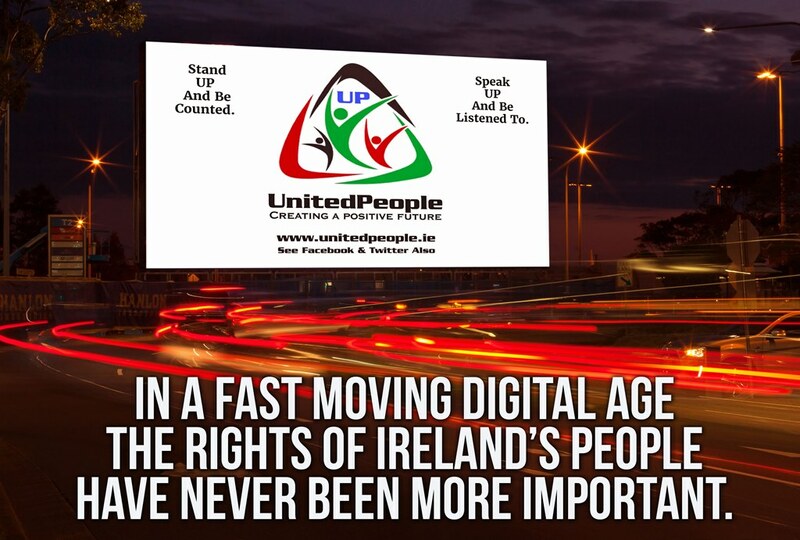 UnitedPeople is seeking the above in relation to protecting the people of Ireland - in this case, also to their every own personal information. It's the right thing to do by all. We MUST NOW greater legal define who has a right to ownership of our personal data and how it is further treated. Right now, because of (a) deliberate political avoidance (b) deliberate vague legal legislation and (c) too much complacency, people's data is being bullied from them, used against them and being given away without express permission sought. why indeed should you chose them to represent you! It would be sheer madness. The USA presidential election was a prime example of how people's personal data, once gain by private companies, was then able to give to parties and individuals, information on citizens. This in turn enabled those seeking a certain voting direction, to aggressively manipulate people. This was done by using their own personal data again the people it originally came from. Citizens in America before they opened their front doors to canvassers, were already known to same canvassers. Voters were given a persuasive sales pitch, based on their own investigated lifestyle choices known. The above is one example of how people's data, obtained by questionable means, was used again an entire nation, its individuals, right down to every street, door step and against every voting citizen. By the way, one company that carried out this operation for a USA party, was based in London - not America. Distance made no difference to the private company whatsoever. Ireland political parties are equally giving foreign private companies, Irish citizens personal data. The elected of course, are not telling you this also. How can my own information be then used against myself? Assume that a medical company wants to obtain information on citizens in an town, through what's generally now available to those with big money, a data broker. A company, business or individual can then target those that are in extreme good health only and by even more defined sales pitch, persuade citizens to buy further medical insurance that they themselves, oft times don't even know, they don't actually need. What if a possible sick person came looking for same medical insurance? By the business or seller knowing in advance through personal data obtained, that the person coming to them is already a liability, the business/seller can (a) give them a more massive higher hiked policy price or (b) if they are legal obligated to give one by state law, give it at a deliberate daft high price that they know the person approaching them, could not possible afford - for the seller would also know everything about their additional living circumstances. Imagine a gambler going to a card table. Before he does however, they know already what way the deck are absolutely card by card stacked. If there is ten tables (towns) in the room, he knows which ones are the best to avoid, right down to numbered stools (homes). The private business gambler wins - the loser is everyone else. People's personal data being handed out by governments and then by companies, sold off as an asset, unequivocally facilitates a scenario described above. Your personal data, what should be YOUR asset, deliberate given away without permission and not in your favour, not only will see you lose out repeatedly in possible advantage - but could repeatedly cost you further in any number of future ways. You are not being told all this could happen or indeed, is happening right now. They have gained the nations "Big Data" on everyone. Then what? Big Data (personal information) has the potential already to become a danger against every individual, in usage. Everything and everyone NOW can be can be tracked and analysed. This is not the stuff of fiction big brother. This is the genuine reality of existing today in a digital era. Even now however, those that would use our very own personal data against us, have only scratched the surface - and what's been uncovered already, is bloody scary! It is possible for others to now collect about our lives, our businesses, our environment, our behaviours. While it might be great for a private profiteer to know EXACTLY what’s happening with its own goods, where does the line be crossed if they want to know everything about what their employees, customers and further national citizens? Data brokers have now become the digital this era's 'private detectives' (they don't require a state licence either) and they are not just investigating one individual alone - they are investigating and cataloguing EVERYONE - then selling that data off or passing it on so it can be used against same individuals. This today's daily reality - not George Orwell scary accurate fiction. Your buying habits? Your social interactions? And if it is possible to track that information - which it now CERTAINLY is - under what circumstances? Who gets to access it? Well, in Ireland it looks like the state departments via certain political parties, for a start has - and they are giving it - you - away. Meanwhile same involved political parties are deliberate ducking making legal clear who exactly owns their personal data! Any wonder why they avoid even bringing up this topic? Not in their best interest to be caught doing it and being held to account? You now, are a recognised "asset" that is being brokered off for others financial gain. All these situations and questions remain avoided by Dail, Seanad and local elected. As they continue to do or allow this all to happen - ask yourself - do they then have your genuine interests at heart? If the answer you come to is "No! ", why should you then vote for them? Why further see yourself and your children, more punished and deprived of rights - digital ones? Privacy problems and discrimination has the potential to become further rampant. Since everything about us can be tracked, it can be used for nefarious purposes. Ireland's privacy laws has certainly not (deliberate?) kept up with today's gathering capabilities and the deep data mining types of data being already scary collected. Who owns the data that is collected about you? It appears in Ireland that you don't as consecutive government are clear giving it all away. They are not telling you this of course. The answer to the question "Who owns the data that is collected about you?" will expose how that data is being used against you right now, how it is being shared and used. Your private life is no longer your private life - its a marketable commodity that has a price on it. This rightly, should alarm you. You have become a financial Customer Lifecycle Value (CLV). A commodity to be traded, passed on - and this is really happening right now. UnitedPeople has previous reported on about this in detail. The more data others are able to obtain on us all, the far easier it is to pare it further down and exploit through particular segments of the population. The state and private companies etc are creating a new kind of discrimination. There are already known instances worldwide of data-driven discrimination happening; car insurance companies, for example, penalising people who drive late at night, but that can impact otherwise safe drivers who happen to work a swing shift, and who tend to be lower-income to start with. All this and far, far more is definable right down to individuals - to use again them - to use against you! Data collected about us, can be used to spy on us. It’s already happening. We know organisations like the American NSA, CIA and others, are using data to spy on people all across America and Europe. Have they ever been held to account for all that, by the way? No. As they are passing same collected data onto same states agencies - who add it all to already other collected data. The present technology right now however even goes further. China has invented a “social credit score” that is impacted by not just what you say and do personally, but what your social media friends say and do as well. Want to apply for a state job? What's your score? Too low? You can't be trusted or you are too willing to call for positive workplace change! You are not getting that job - not even an interview. Russia's Red Web is a recognised a back door to the Internet, allowing Russian intelligence agencies free access to every Russian ISP - and that's just to begin with, what's known. Where does national security end and privacy begin? It’s a question that elected are in no hurry to answer as some continue to exploit the current situation for their own gain - or their friends gain. Even for those that might have gain a personal or party finance donation from? The danger of cyber crime and hacking. Regular now in the news, we read about cyber-attacks and misuse. Truth be told, the cases we do find out about are in reality a small 'tip of a larger iceberg'. Companies with digital data don't like to expose they have been hacked and data stolen. It's bad in PR terms and in financial liability. They only tell of hacks when they really have NO choice.Remember when bad people had to physically steal a laptop or hard drive to access sensitive files? That's no longer the case. With every new data security invention, you can be sure there is a challenger or criminal somewhere out to attack it for ego, political or financial reason. It's bad enough that your personal data is being collected and daily collated by state agencies - who then are all too willing to give it all regular away - again without your express permission. ...Now, the more it's then asset shared/sold onward, at each storage point, your data more and more becomes further into the domain of potential criminals. A ticking cyber time-bomb for some people, is just waiting to be cracked open! The individual could pay a further cost while those holding such information, criminal or previous company, have it only to gain for themselves. In short, big data and the now giving away of your personal data is undeniably dangerous. Your data is safe? Are you really going to fall for that PR pitch from elected - while they also still give it away? Ireland CLEARLY needs new stronger defined, legislation. NOW! Defending the rights of the nations people one hundred years on from 1916, also now means having to do it right online now as well as off-line, in the real world. Anything less in action and positive result, is only coming from those that are not worthy to be elected or not be re-voted back into an electoral position. On order in part, to complete the above (which could be expanded on even further), I embarked upon a year long third level course in professional marketing with Dundalk, Co Louth, DKIT. An excellent third level college. In over a year of constant research, I have spoken to many - some who wish to remain anonymous. I have spoken to professors, I.T. techies, elected at various levels, traveled around the country and more. What has happened with Irish Water and other institutions forced down the throats of a nation of people, are themselves, situations and problems to be singular resolved. Combined, they are all part of a larger picture. One that elected past and present doesn't wish the general public to be aware of and thus, confront them with. Peaceful confront them we must, however... Not just our rights are being long term exploited but from their very conception, your children's rights are too. In 2017 it's time to say "ENOUGH!" to a lot of things - and abuse and transfer of our personal data should be URGENTLY tackled also. 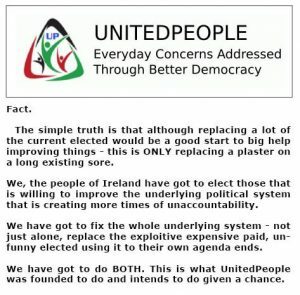 A further aim of UnitedPeople.